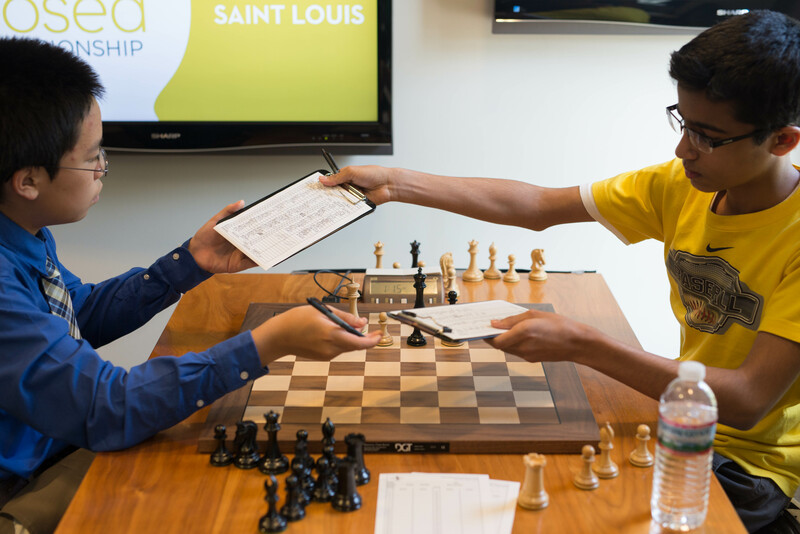 Without a doubt, the game of the day was the match between Ruifeng Li and Akshat Chandra. Chandra went into the game today with a full point lead over the field, with an outstanding score of 3.5/4. Li, was looking to get back into contention with a win today. Li started out with his standard 1. e4 and Chandra responded with a different Sicilian today. Chandra might not have been as familiar with his choice, the Taimanov Sicilian, because at one point out of the opening he was down over an hour on the clock! Li continued to play moves quickly, keeping the pressure on Chandra. Chandra’s position looked questionable and by move 15 he was already in serious trouble. A potentially disastrous mistake occurred on move 16 for Black, when Chandra chose to accept a pawn sacrifice that blew open his King’s position. This would have proved decisive if Li played the superior move 18. Rhg1. If Li played this, it wouldn’t be surprising to see Akshat resign. Li’s choice of 18. Bh6 was winning but allowed Black to resist. Chandra defended very creatively, marching his King from its castled position over to the queenside. This was definitely a risky thing to do, but by the time the King fulfilled its journey to the c7 square, it was completely safe! Chandra was even able to begin a strong attack, forcing White to play moves that are usually very undesirable in the Sicilian, like 26. Nb1, and 27. Kd1. It looked like Chandra would somehow escape from a totally lost position all the way to an incredible victory. The position was still complicated though, and with such a major time disadvantage it would have taken some extraordinary play in order to navigate the complications in such a limited amount of time. The complications soon fizzled out to a drawish endgame when Li sacrificed an exchange in order to eliminate Black’s powerful dark-squared bishop. Neither player could do much in order to disturb the balance, and a draw was made shortly after the time control was reached. Without a doubt one of the most exciting games that we have seen this tournament, and a game in which all 3 results were possible! A great display of fighting spirit from the players. Xiong has been off to a solid start, probably more solid than he would like. With the score of 2.5/4 he needed to start winning games in order to catch the leader, Chandra. Despite an extremely slow game with maneuvering struggle, he would eventually get his chance. He found a nice tactic in the endgame based on trapping Liou’s pieces in the middle of the board. This looked like the end of the story, but it was just the beginning. The players fought a strange rook+knight+pawn vs rook+pawn endgame that was nearly impossible to win for Xiong. The players continued in constant time pressure through move 125 before a final mistake from Liou. Xiong capitalized on this and took a win and moving himself within a half point of the lead! Liang showed his impressive opening flexibility today with his choice of the 4. f3 Nimzo-Indian. The game followed the format of a game that Harmon-Vellotti played against GM Chirila. Liang was the first to deviate. This worked out in his favor, earning an advantage in a very imbalanced position. Liang made the most of his bishop pair, finding a powerful tactic, 27. Nxg7! with a large advantage. Ironically in round four, it was this very same idea that was potentially extremely strong in his game with Black against Arthur Shen. Harmon-Vellotti defended well, and after several mistakes from White, he was pushing for the win. He collected the full point on move 73, winning his first game of the tournament. Shen went into round five with the odd distinction of White having a perfect 100% score in all his games. With the Black against Han, surely he wanted this streak to end. The game started out in similar fashion to the Vellotti - Chandra game from round one. That game turned out well for Black, and this opening did as well. The game slowly continued in a positive fashion for Black until Han won a pawn on move 40. The extra pawn gave Han a nice advantage but Shen turned the tables, eventually grinding his opponent down. Shen broke his streak on move 68 when Han resigned. This game looked to have potential for excitement. Brattain sacrificed a pawn out of the opening for lasting positional pressure. The long-lasting positional pressure, didn’t last long. Bodek found a solid way to give back his extra pawn, reaching a position with symmetrical pawn structure, even material and opposite colored bishops. It looked like a draw was certain, and after exchanging all pieces except the opposite colored bishops, a draw was agreed.